A few weeks ago I was contacted by the lovely people at My Pouch asking me if I’d like to review their fab pouches for food on the go. 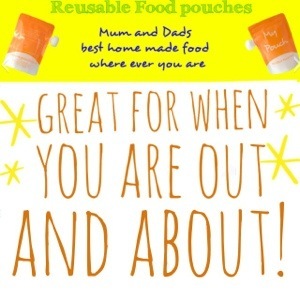 This idea was new to me as, even though I used the well known pouches in the shops with my second child when we were out and about, I had never heard of pouches in which you could put your own food. What a brilliant idea! I love creating and cooking for my children when they are weaning and so the thought of being able to take this food with me in an easy package was very appealing. I am rubbish with Tupperware and constantly have bowls with no lids or lids with no bowls and even now I have three children am no better at taking home cooked food out with me. 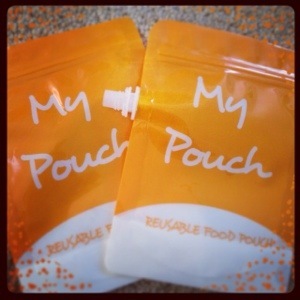 The Reusable Food Pouch is a convenient way to store home cooked food. It is very durable, and can be put in the dishwasher and the freezer. 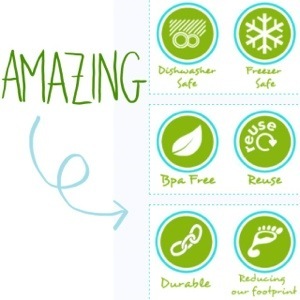 BPA free it’s also very safe and has a cap which cannot be swallowed, very child friendly! Now my third child can be a pickle when it comes to food and very rarely would take anything puréed from a spoon, so I was interested to see how the pouch would work with slightly lumpier textures. Spaghetti bolognese, a firm favourite with all three of my children, was something he would eat and could with his hands, and something that I didn’t feel the need to purée to a pulp. In short the pouch was fantastic. The wide opening made it easy to fill with the lumpier texture and it was also extremely easy to get out at the other end, perfect! Also in the hot weather I have been mixing fruit and yoghurt, putting it into the pouches and then freezing them to make a lovely cooling snack. I’m not ashamed to say that I’ve also eaten a fruit smoothie out of a pouch…it was very refreshing! As a mum I wanted to give my child home made food wherever possible, and now whether I’m in the park, at the shops or at the seaside I can! I would recommend these pouches to use when you start weaning, not only are they brilliant for their very first foods, but they also make useful storage for snacks when they get older. A very convenient way to get healthy food into your children where ever you are! !